Steve Storey, Pemberton. Justa Jeskova photo. “A bike weighs 30 pounds, and your average rider weighs 150–200 pounds. So you’ve got this machine, that’s a small part of your bodyweight . . . and it makes you superhuman.” —Ian Ritz, Chromag Bikes. Far removed from the early day, giant-wheeled bicycles of the 1800s, contemporary bikes are complex machines that can bestow their riders with the power of flight, agility and super-human speed (as well as the power to make money disappear). Most importantly though, a bicycle gives freedom — to the four-year-old freewheeling down a driveway or the seasoned veteran dropping into a Redbull Joyride course: every ride is a world of possibility. Whilst mountain biking may have originated in 1970s Marin Country (a ‘fact’ that is arguable but widely accepted to be the easiest-to-stomach, historical compromise), it was elsewhere that it matured and left behind its road-riding cousin. Not long after the genesis of balloon-tired mountain bikes on Mount Tam, farther up the West Coast, across the 49th parallel, there was a small cabal of mountain biking dissidents carving an evolutionary precedent for where mountain bikes should be ridden and how trails are built. Bryce Lamont, North Shore, circa, 2001. Sterling Lorence photo. 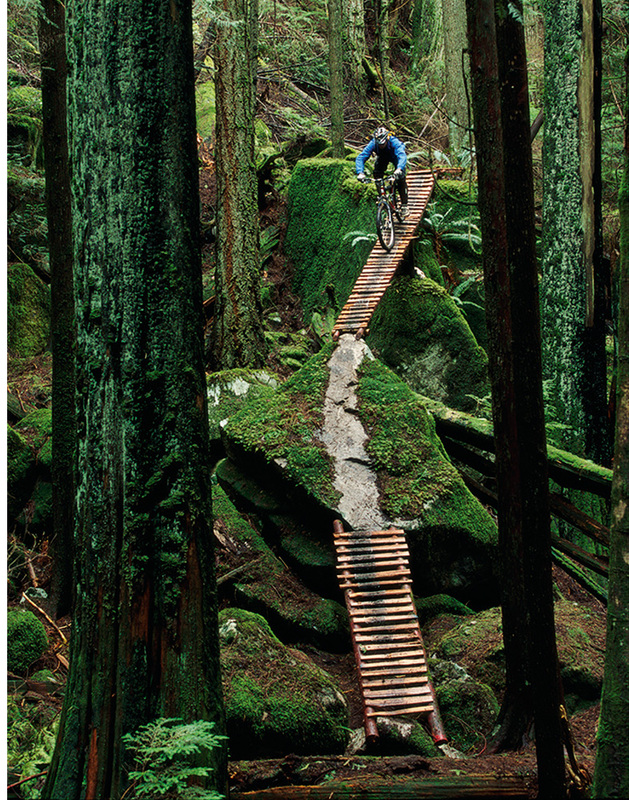 These riders weren’t just burning grease down reclaimed logging roads or fire breaks, but instead crafting lines and linking together natural features that were previously thought off-limits. 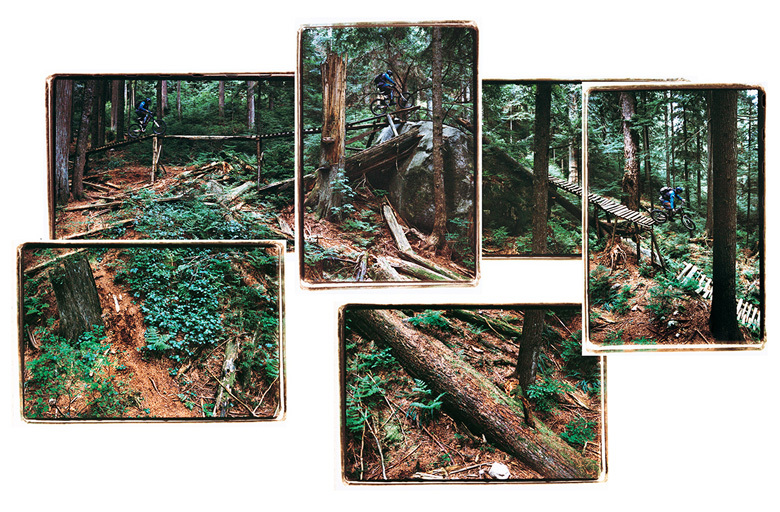 Riding down perilously steep terrain deep in the coastal rain forest of the Vancouver North Shore, rock faces and logs were not seen as obstacles around which trails should wind, but rather the focus of the riding experience. However, the North Shore’s greatest contribution and most startling innovation occurred when the first plank was laid. 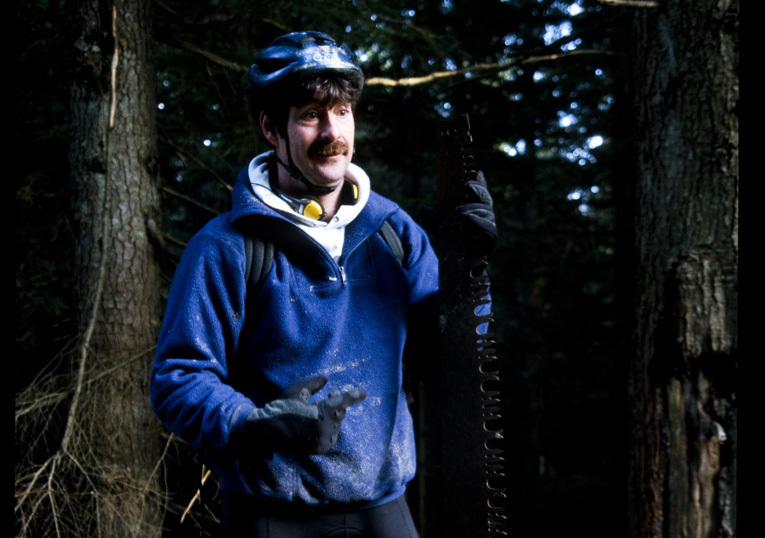 Todd “Digger” Fiander started digging trails in the woods 35 years ago — the same year he purchased his first mountain bike. Early trail creation involved moving deadfall and foliage to make a rideable corridor, but one day while kicking forest duff and detritus around to make a line through the towering organ pipes on the North Shore, Todd uncovered a piece of cedar which gave him an idea. He took the eight-inch wide rough plank and placed it against a boulder to act as a ramp. It added a novel technical challenge and was the first crucial step in the evolution of the North Shore trail building genus. The rest is history. Digger began laying planks where steep rollovers required a transition or where soggy land needed to be crossed (a common occurrence seeing as the North Shore gets an average of 166 days of precipitation each year). It quickly struck Digger that he could span larger sections by creating ladder bridges made from the natural materials found in abundance in the forest. 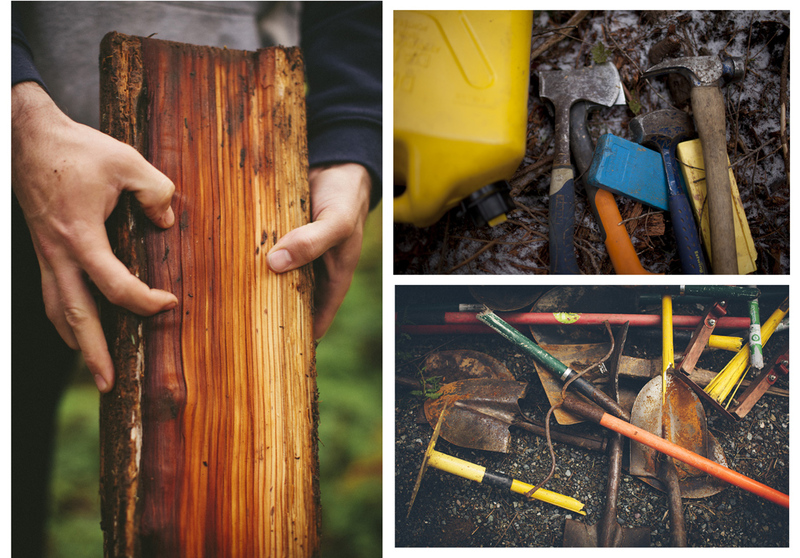 The Western Red Cedar that grows in the Pacific Northwest is tough, hardy, and naturally resistant to rot, so this wonder wood was put to use. In many cases, building bridges became not just the easiest, but the only way to link a complete trail. 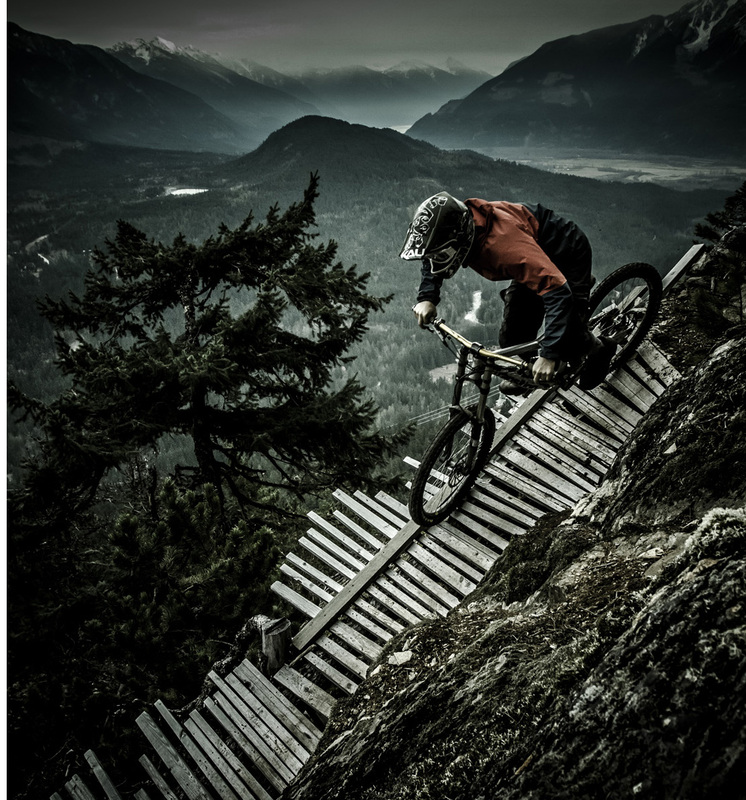 By the late 80s other builders and riders on the North Shore had not only adopted the ladder-bridge concept, but also began building entire trails in this manner, elevating ladders higher and higher, while also cutting them narrower and narrower. The North Shore. Sterling Lorence photo. Fuelled by his restlessly creative mind, Digger hatched a mad plan — to add movement to the trail, or more specifically movement in the trail. 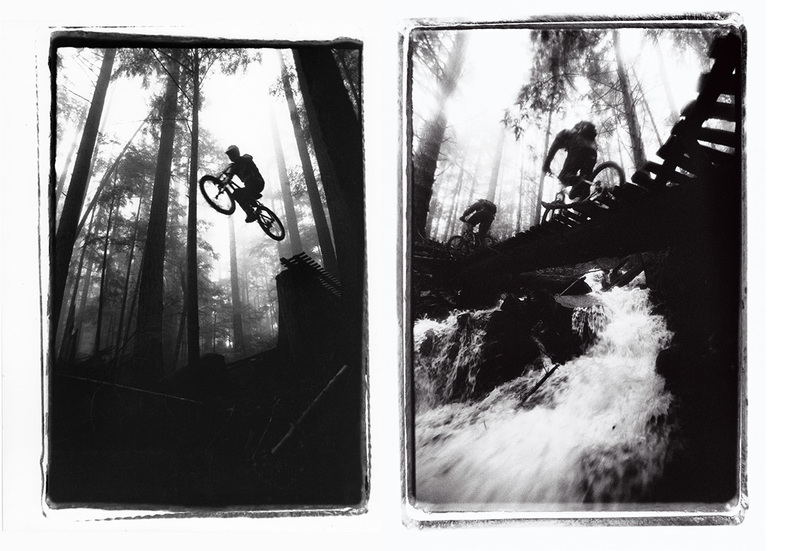 In 1992, while working on his magnum opus, Ladies Only, Digger took a piece of cedar, raised one end and built a fulcrum in the middle — the teeter-totter was born and the North Shore became a true mountain biking playground. Digger deserves credit for building the first ladder bridges and integrating features or stunts into his trails, but it was other riders like “Dangerous” Dan Cowan who took inspiration from him and pushed it skyward with trails that left terra firma well behind and were often barely as wide as a mountain bike tire. Such trails integrated teeter-totters into the balance beams and would often finish with a mandatory drop. After years of ignoring the North Shore, the fraternity of fair-weather riding media/industry glitterati was forced to take notice. Everyone wanted a bit of the North Shore action because it was so wild and rowdy compared to the Johnny Lycra mountain bike status quo, busy lapping fields with their heads down and arses up. But with fame came infamy. It was the early 2000s when the media spotlight brought negative attention to the area. Trails of this nature came under fire because of the risk that they posed in an increasingly litigious culture. Most of these trails and stunts were torn down, sometimes by shadowy vigilante figures referred to by bikers as the “Trail Nazi,” or by local governing bodies. Even today, the Shore is not without conflict — last year concerned riders used wildlife cameras to capture video of an elderly woman laying sticks and setting “traps” on popular bike trails. Regardless, the heritage and significance of ‘The Shore’ reverberates around the world and has, arguably, inspired and evolved more aspects of mountain biking than any other area in the world. Riders dream of making a pilgrimage to test their mettle and trail builders around the world try to recreate something of the North Shore on their home turf. Big thanks to Digger, Dan, and the dozens of other lumberjackasses who saved us from a fate worse than following white lines or just following in the backdraft of Spandex-clad bottoms wiggling between the tape. Learn how to pack for a multi-day mountain bike trip here.